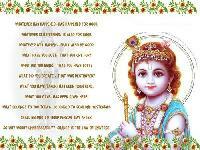 Krishna Janmashtami also known as Krishnashtami, Saatam Aatham, Gokulashtami, Ashtami Rohini. Celebrate this as festival of devotional songs and dance performances by young children. 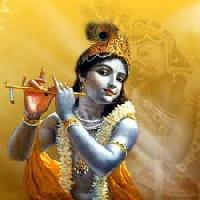 Krishna, also known as Murlidhara, or one who holds the flute, loves music. And so will your friends and family, as you take turns singing and playing instruments. Alternatively, play bhajan CDs and heighten the spiritual atmosphere. Have a midnight aarti with a kirtan. This is the exact time that Krishna appeared on this planet, so it is most auspicious and spiritually inspiring. If you have aarti paraphernalia, then you can do a full offering. If not, dont worry, Krishna says in Bhagavad Gita, If you offer Me with love, a leaf, flower, fruit or water, I will accept it. So offer whatever you can, it your love and devotion that matters. jag me sunder hai do naam chahe Krishna kaho ya Ram by Shri Anup Jalota. Kaun Kehate hai Bhagwan Ate Nahin sung. Sabse uchi prema Sagai sung. Hare Krishna Hare Rama by chiniwillly. it always nice to cook very special preparations to offer to the Lord. Imagine that Krishna was actually right there, in your house, what would you offer Him This makes for a wonderful meditation while cooking on Janmashtami. Aloo Chaat,Apple And Almond Halwa,Banana Yogurt Shake,Cashew Cake,Cashew Cake,Coconut Burfi,Cucumber Pepper Raita,Gopalkala,Jeera Aloo,Kaju Burfi,Kalan,Kanjeevaram Idli,Kesari Halwa,Khoya Burfi,Kuttu Ki Puri,Kuttu Paratha,Kuttu Rajgiri Parathas,Lapsi,Low Calorie Nawabi Curry,Makhaane Ki Kheer,Mango Pudding,Masala Bhat,Masala Masoor,Sweet Lassi,Vermicelli Kheer,Vrat Ke Chawal etc. Janmashtami is not just as festival. 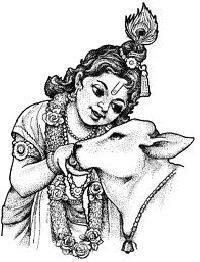 It is the time to rejoice in the glory of Lord Sri Krishna and his achievements. 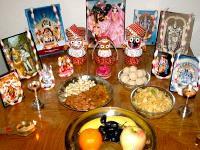 Gifting your friends and relatives is a primary aspect of the festival. This will appropriately convey your feelings towards your friends and relatives and show respect and care for your elders. 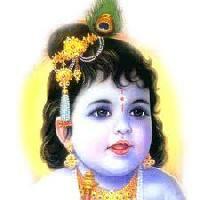 Janmashtami ke is shub avsar par. Hum ye kaamna kartey hai ki.Shree Krishna ki kripa.Ap par, aur app ke pure parivar par .Hamesha bani rahey .Jai Shree Krishna.